Tae is a first-year student at Hanasakigawa Girls' High School and the lead guitarist of Poppin'Party. The other members call her O-Tae. Tae lives with her parents and 20 rabbits. She has considerable skill with the guitar, since she started playing it when she was in elementary school. As a huge lover of music, she started working part-time at a live house after entering high school. Tae at first doubted Kasumi's idea to audition at Space when she told her about it, because the band needed a considerable skill level to pass. 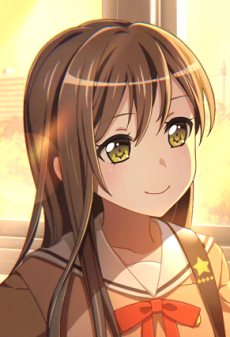 But when Kasumi performed for the first time in front of their friends and family with Arisa, Rimi, and Tae herself, Tae realized how much fun she had performing with them and then she joined Kasumi's band as its fourth member, since she was impressed by their own performance and believed in their own potential. A relaxed individual who lives at a steady pace, Tae sometimes surprises the people around her with her keen observations and understanding of music. She carries a sense of knowing in her discussions with others, while always keeping an optimistic outlook on a situation. She loves rabbits and is constantly thinking about them, sometimes to the point of daydreaming and losing focus during a conversation. She has compared both Rimi and Arisa to them (Rimi because of her overall nature, and Arisa because her twin tails remind Tae of a rabbit's ears). She affectionately refers to one of her rabbits, Odd-Eye (Occhan in Japanese and Oddie in the localized version), as her boyfriend.